Bucharest in the 1980s. Ceaușescu’s ‘systematisation’ programme is in full swing in the Romanian capital: one-third of the historic centre has been wiped out to make way for imposing edifices and wide avenues intended to honour the regime. 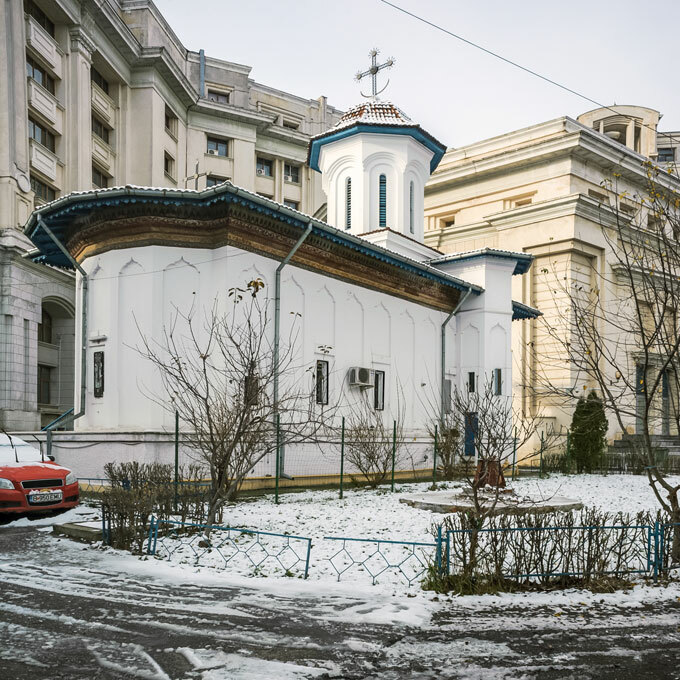 Despite Ceaușescu’s particularly dogged approach towards the churches, seven are spared and undergo a process as incredible as it is absurd: they are lifted and placed on rails then moved and masked by housing blocks. Other religious buildings, such as the Great « Polish » Synagogue, are hidden behind socialist panel constructions. 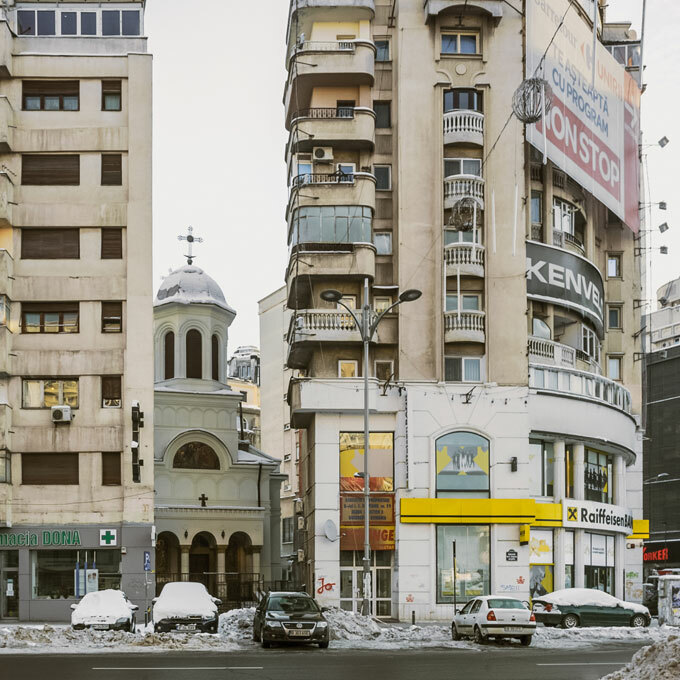 Withdrawn from the cityscape, these buildings live secret lives, interpolated in the disparate architecture that shapes Bucharest’s urban landscape today. Combining photographs with archival material, this critical inventory reveals a lesser-known yet fascinating urban and political story. The series has a special resonance in Berlin’s Chapel of Reconciliation, which was built on the foundations of the former Reconciliation Church, a historical building that was blown up by the communist SED regime in 1985, thus sharing the fate of many Bucharest churches. An exhibition by the Parish of Reconciliation Berlin-Wedding and the Berlin Wall Foundation. 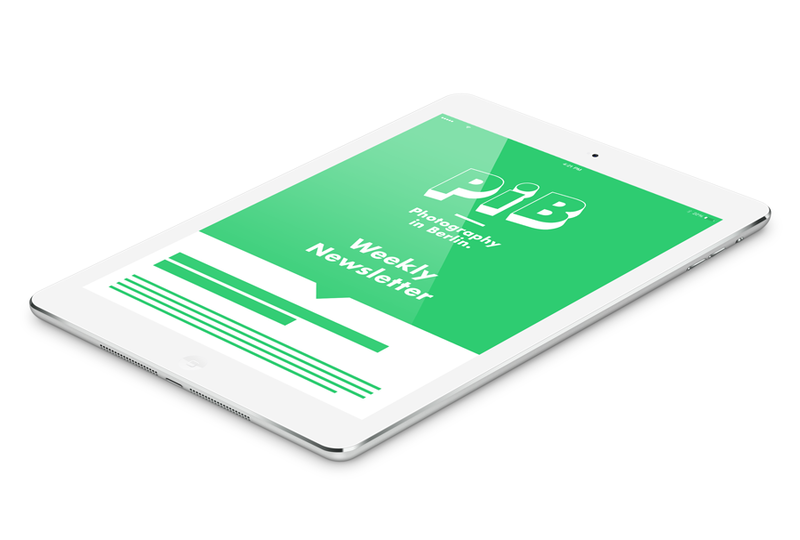 In collaboration with the Romanian Cultural Institute Berlin. The exhibition is part of the programme of MakeCity Festival 2018 in Berlin (June 14 – July 1). The book Mobile Churches is published by Kehrer Verlag, Heidelberg. 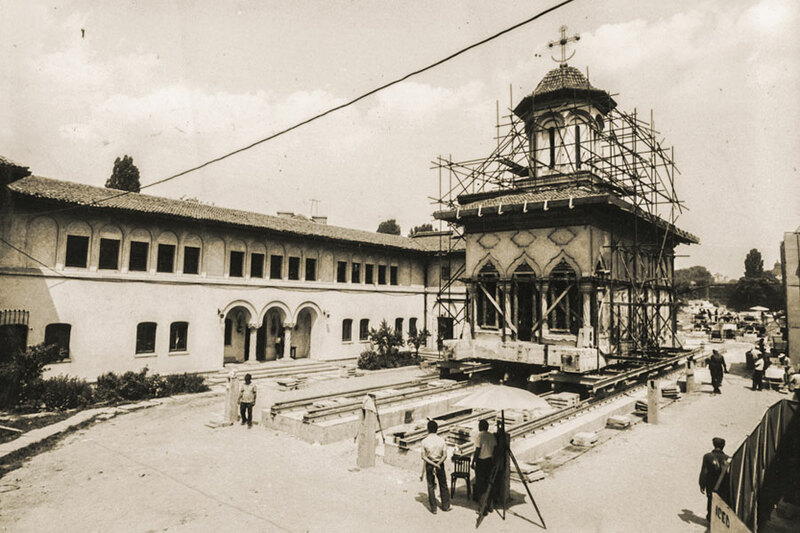 In addition to Bucharest’s seven displaced churches, twenty other churches as well as three monasteries and three synagogues were destroyed under Ceaușescu’s communist regime. They thus shared the fate of several churches in the GDR, such as the Reconciliation Church, the St. George’s Church and the St. Peter’s Church in Berlin-Mitte as well as others in East Berlin, Rostock and Leipzig. Both the Ceaușescu dictatorship and the SED were ideologically and politically opposed to the Church. The churches were the main victims of both governments’ ambitious urban planning policies as well as their aspiration to intervene in the collective memory of their peoples and to destroy their familiar symbols. In Bucharest, moving buildings on rails was a particularly surprising solution. From 1982 to 1989, seven churches were therefore saved through a complex technical procedure. But the intention of banishing these churches from their historical and cultural context cannot be overlooked. By being separated from their spatial environment, they have largely lost their symbolic dimension. Other religious buildings, such as the Great « Polish » Synagogue, were not displaced but again isolated behind high housing blocks. 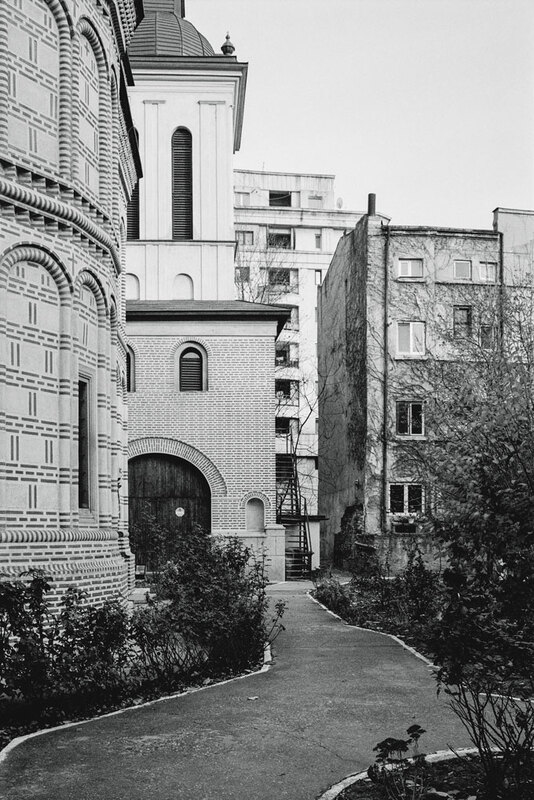 Current photographs of the churches and the synagogue convey a dreary aspect in a similar way to archival photographs of the Reconciliation Church that show the building, which was eventually blown up in 1985, confined to the death strip between the ‘border wall’ and the ‘hinterland wall’. The reasons that led to the destruction of churches in the GDR are today the subject of historical research. In Berlin, a chapel of modest proportions has been built on the foundations of the former Reconciliation Church. In Romania, the arbitrariness of Ceaușescu’s decisions remains the sole explanation for the sacrificed churches, while in Bucharest a monumental cathedral is currently being built on a scale that is set to compete with Ceaușescu’s pharaonic House of the Republic, which had previously justified the destruction of the city. Anton Roland Laub, born and grown in Bucharest, moved to Germany in 2000 where he studied at the New School for Photography (Neue Schule für Fotografie Berlin) and the Weissensee School of Art in Berlin. 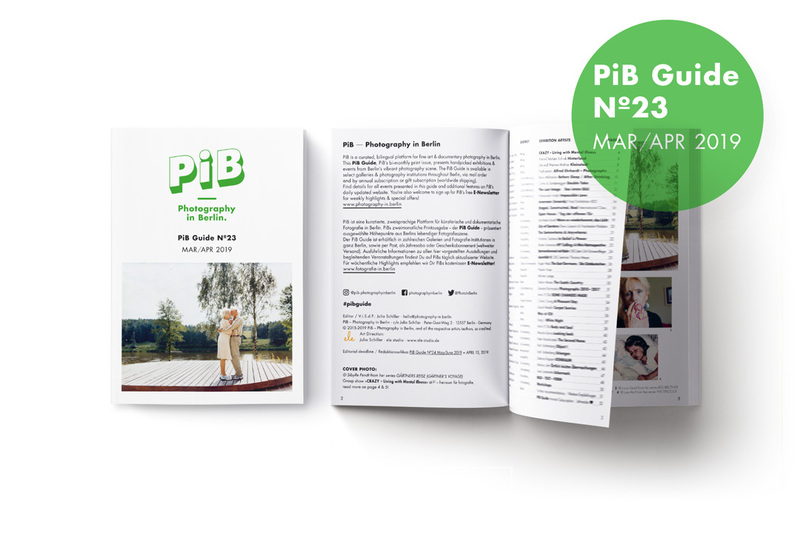 Bucharest’s recent history – seen particularly through the prism of urbanism – as well as the stigmata of Ceaușescu’s dictatorship are one of his main focuses as a photographer. Sonia Voss, curator and author, lives in Paris and Berlin. Latest projects: Anton Roland Laub. Mobile Churches, Rencontres de la Photographie / New Discovery Award, Arles 2018 & Saint-Germain-des-Prés Church / Photo Saint-Germain, Paris 2017, Curators’ Choice, Springer Galerie, Berlin 2018, Déjà Vu. Thibault Brunet. Isabelle Le Minh, Kehrer Galerie, Berlin 2018, Sophie Calle. Beau doublé, Monsieur le marquis !, Musée de la Chasse et la Nature, Paris 2017-2018, Josef Koudelka. Invasion/Exiles/Wall, C/O, Berlin 2017, George Shiras. L’Intérieur de la nuit, Musée de la Chasse et la Nature, Paris 2015- 2016.